One of the keys to providing great entertainment is understanding your audience. For a theatre company, that means knowing what your audience wants and then being able to provide it so they keep coming back for more. Independent Shakespeare Co. has done a brilliant job of both. Not only do they play to crowds that number in the thousands each night during their Griffith Park Free Shakespeare Festival, but they always find a way to connect with the audience and make them feel like they’re in on the fun. 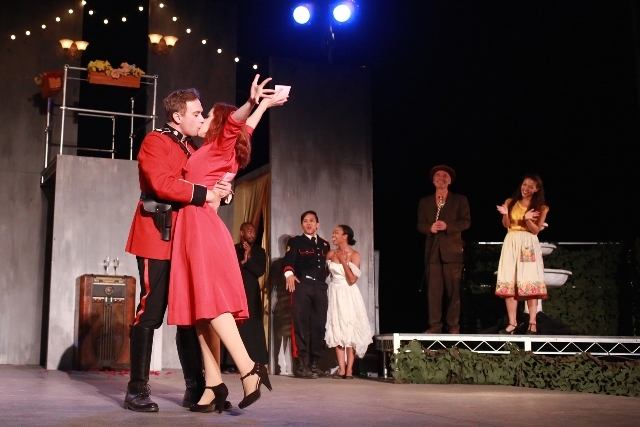 In Much Ado About Nothing, their latest production in the park, director Jeff Wienckowski ensures that connection with staging that often takes the characters out among the people, with plenty of hilarious results. The famous pair of scenes in which Beatrice (Melissa Chalsma) and Benedick (David Melville) are each fooled by their friends into thinking the other is in love with him or her takes place right in the laps of those on the lawn, much to the delight of everyone around them. When Beatrice goes a little crazy and screams at a young man to give her his chair so she can take it down to the lip of the stage and sit on it while watching the scene, the resulting payoff is priceless. And when Melville, disguised as an Italian gelato seller, wheels his ice cream cart on the grass in front of the crowd, no one could have guessed that one little girl – no more than 3 or 4 years old – would be so convinced that he was really an ice cream man that she ran down while he was scooping up cones for the characters on stage and asked for her own. Never one to miss an opportunity for a laugh, Melville played it straight, gave her the cone, and won the hearts of everyone watching long before Chalsma’s Beatrice gave him her own. Shakespeare’s witty dialogue soars in the hands of this real life husband and wife duo who charm every comic nuance out of the text. There are, of course, serious events that take place as well but this is largely a lighthearted treatment of the story and most definitely an entertaining one. 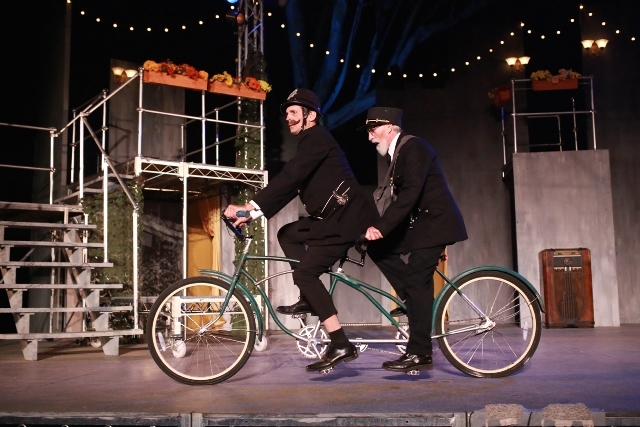 You’ll have to wait until the second act when the law arrives to see André Martin’s malapropism-prone Dogberry but this keystone cop on his bicycle built for two (with Thomas Ehas as his second, Verges) is worth the wait. Those paying attention at intermission may notice the pair strolling the crowd, but beware. They’re on the clock and if you aren’t careful, you may be issued a citation. William Elsman earns boos and hisses for his villainous portrayal of Don John, a deliciously evil malcontent who will use any means necessary to gain the upper hand. Both Danny Campbell as Hero’s (Danny Brown) father, Leonato, and Erwin Tuazon as her intended, Claudio, advance through Shakespeare’s unsettling progression of emotions with staunch intensity. ISC’s version of Shakespeare’s beloved comedy is set in 1945 in Messina, Italy just after the war and that means a musical soundtrack featuring big band swing tunes of the 1940s plus some lovely original compositions by Chris Porter. Leslie Stevens choregraphs several fun swing dances that carry through the celebratory feel of the time period. It’s another hit for the Independent Shakespeare Co., LA’s equivalent of New York’s Delacorte in Central Park. Our distinct advantage is that these players play among us. And that’s more than half the fun. With your family, friends, and a picnic to share, it’s a guaranteed good time, and one of the best ways to spend a summer night in LA. Celebrate summer! ISC is also bringing back its summer hit Romeo & Juliet for one more weekend at the end of the season, September 3, 4 & 6 so if you missed it, you’ll get three more chances to see their punk rock version of Shakespeare’s most famous love story.